Ripon Combined Middle School-High School TIA - TADI - Traffic Analysis & Design, INC. Ripon Combined Middle School-High School TIA - TADI - Traffic Analysis & Design, INC.
TADI's Role: To evaluate traffic volumes and impacts of the combined middle school and high school on Tiger Drive in Ripon, Wisconsin. The analysis considered on-site traffic circulation patterns for the separate middle school and high school entrances, and provided alternative analysis and modification recommendations for the new school driveway to E. Summit Street. The Ripon School District in the City of Ripon, Wisconsin is expanding the existing high school building on Tiger Drive for a combined high school and middle school building. The existing middle school on Metomen Street will be razed and replaced with tennis courts and two parking lots. When reconstructed (opening expected for the 2016/2017 school year), most of the middle school classrooms will be located on the east side of the middle school/high school building. According to school officials, the combined high school/middle school would accommodate the existing students at both schools, plus room for additional student population growth. Part of the expansions plan for the combined middle school/high school building includes the creation of a new school driveway aligning with the south leg of the E. Sullivan Street/St. Wenceslaus Street intersection. St. Wenceslaus Street is currently restricted to one-way southbound only movements, but would switch to two-way operation with the reconstruction of the school. To reduce traffic conflicts, the one-way westbound leg of E. Sullivan Street would be curved down to meet the one-way eastbound leg of E. Sullivan Street just east of St. Wenceslaus Street in order to create a single, two-way approach at the intersection. 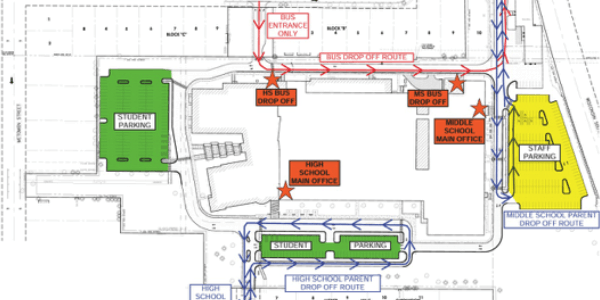 A traffic impact analysis (TIA) report was prepared to evaluate the traffic impacts of combining the middle school and high schools in one building with shifted parking areas, driveways, and entry points into the expanded school. The TIA evaluated the existing peak hour traffic volumes at select study intersections in the vicinity of the school site, the reassigned traffic volumes expected from the relocated middle school, the reassigned traffic expected from the shifted parking areas, driveways and entry points, plus the additional traffic volumes expected from the potential growth of the schools (to 425 middle school students and 625 high school students). The TIA also provided recommendations for maintaining acceptable traffic operations at the study intersections through the buildout year.